Also, Five Lieder. Elisabeth Schwarzkopf; Christa Ludwig; Otto Klemperer, Philharmonia Orchestra. EMI Classics 7243 5 67035 2 0. Only a couple of conductors who had actually worked with Gustav Mahler made it into the stereo era. Otto Klemperer was one; Bruno Walter another. 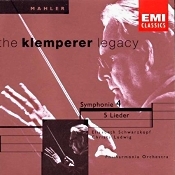 When Klemperer performed his first public concert in 1912, it included the Mahler Fourth Symphony. Do these associations make Klemperer's Mahler interpretations definitive? No. Klemperer, as always, was too idiosyncratic for one to call any of his performances the last word on the subject. But this 1961 recording with the Philharmonia Orchestra can surely be considered authoritative, and there is no reason for not auditioning it. It has certainly grown on me over the years. Klemperer was a conductor known for the massive ruggedness of his realizations, yet it is for his gentler, more subtle readings that I have come to appreciate him: His Beethoven Pastorale, his Mendelssohn Fourth, his Haydn "Clock" Symphony. The Mahler Fourth falls into this balmier category. He takes the first movement at such a winsomely unhurried gait that one can hardly fail to fall under its spell. Klemperer's pace is slower here than most other conductors, to be sure, and totally unforced, establishing an exemplary tone for the opening's childlike description of the peacefulness of Heaven. Taking the Scherzo so leisurely may be another matter, but it does no harm and actually makes the second movement seem less bizarre than usual. It is in the third movement, however, the Adagio, that greater controversy arises. Contrary to expectation, Klemperer takes it at a faster tempo than anticipated, faster than probably anyone on record. It may not convey the eternal repose of those heading toward the gates of Heaven, but it voices fully the opening of those gates and leads perfectly into the expressive innocence of the finale's poem. Well, expressive innocence for the orchestral parts of the finale, perhaps; however, Ms. Schwarzkopf's rendition of the vocal part does seem a bit too mature and sophisticated for the role. It's a minor drawback, like the unusual Adagio, and should not hamper one's enjoyment of the symphony overall. I have lived with this recording for close to fifty years, coming to it on LP in the late Sixties just after reading a scalding review that I remember called it something like "menacing" rather than sweet, and framed in "cavernous" sound. The first criticism I could never understand. There is nothing even remotely "menacing" about it. As I said, it is a most attractive, engaging, light, and gentle interpretation, if a trifly eccentric, with the Philharmonia at the height of their performance standards. The second criticism I read about, however, the "cavernous" business, possibly derives from the reviewer having heard the piece only on an old Angel LP. In those days, there were often considerable sonic differences between American Angel and English EMI releases. Today, we have several CD incarnations of the performance, and the sound is quite good. As a part of EMI's "Klemperer Legacy" series, the edition I own has a warmer, smoother response than before, yet it retains its clarity. Indeed, of the seven or eight Mahler Fourths I had on hand for comparison at the time of this review, it was the Klemperer disc that sounded clearest to me (although at higher volume it could also be a little noisier and the treble more prominent than the others). At least some of the recording's lucidity no doubt stems from EMI's recording techniques, original engineers Douglas Larter and Neville Boyling's audio competence, and producer Walter Legge's finicky production values. But I suspect it is also due to Klemperer's ability to retain clean lines throughout the biggest orchestral passages. What's more, the recording projects a proper stereo spread, depth, and ambiance to communicate the experience of a live event (although EMI recorded it without an audience in Kingsway Hall, London, 1961). The Mahler Fourth is worthy of multiple interpretations, to be sure, and one should investigate as many of them as possible. Welser-Most (EMI Eminence or Warner Classics) appears even broader than Klemperer; Karajan (DG) sounds grander; Maazel (Sony) more sugary and Romantic; Previn (EMI) more playful; Solti (London) and Abbado (DG) more intense; Gatti (RCA) more rambunctious; Colin Davis (RCA) more refined; Szell (Sony) and Haitink (in the second of his three Philips releases) perhaps most unaffected of all and safest choices of mine in this work. Yet it remains Klemperer to whom I find myself returning most often for pure listening pleasure. I can't explain it really; I can only enjoy it. Also, Carnival of the Animals. Daniele Rossi, organ; Martha Argerich, Antonio Pappano, pianos; Antonio Pappano, Orchestra dell-Accademia Nazionale di Santa Cecilia. 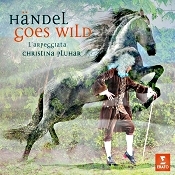 Warner Classics 0190295755553. There's always room, I suppose, for another recording of an old warhorse, in this case the Saint-Saens Third Symphony, know popularly as the "Organ Symphony." Whether the newcomers measure up to old favorites, it's always good to hear what different conductors can do with a work, and, to be sure, Maestro Antonio Pappano, organist Daniele Rossi, and the Orchestra dell-Accademia Nazionale di Santa Cecilia give it a good shot. As you may know, French composer Camille Saint-Saens (1835-1921) wrote the Symphony No. 3 in C minor, Op. 78 "Organ" in 1886. Because it is a colorful, sometimes bombastic, and thoroughly pleasing piece of music, it has enjoyed enormous popularity over the years. Although audiences recognize the piece by its nickname, the "Organ Symphony," the organ really only has a part in the second-movement Adagio and the later half of the Finale. Saint-Saëns called the work "a symphony with organ," and said of it, "I gave everything to it I was able to give. What I have here accomplished, I will never achieve again." Apparently, he knew whereof he spoke (or he was too contrary to go back on his words) because even though he lived another thirty-five years, he never wrote another symphony, organ or otherwise. The first movement of the symphony has always seemed to me the least distinguished, the least characterful, and I can't say that Pappano makes it any the more distinctive. Still, he injects as much life as possible into the affair, so there is no want of thrills. The second movement Adagio always reminds of great, soft warm waves flowing over and around one's body on a sunny, tropical beach. The organ comes in with these huge, gentle washes of sound. Here, Pappano makes it warm and gentle enough but the organ doesn't carry the weight it should to make much of an impression. 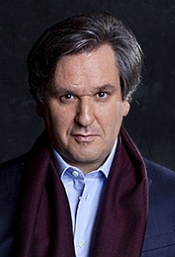 The two movements that comprise the finale should be fiery and exhilarating, and it's here that Pappano carries the day. The Presto abounds with energy, and when the organ enters at the last, it may not be as deep or rich as it could be, but it is loud and it does generate a good deal of excitement. Coupled with the symphony is Saint-Saens's humorous Carnival of the Animals suite, which he wrote the same year, 1886, as the Third Symphony. He scored it for two pianos, two violins, viola, cello, double bass, flute and piccolo, clarinet, glass harmonica, and xylophone, and here's where this recording shines. Both Pappano himself and Martha Argerich take the piano parts. While Pappano is a fine pianist, no doubt, Argerich is universally acclaimed as a great pianist, one of the finest pianists in the world. So it's a treat having her in on the festivities. Saint-Saens considered the work too light for him to publish, that if he did it would distract from his more serious compositions. He did, however, leave instructions that it might be published after his death, so the first public performance didn't occur until 1922. Today, of course, audiences have come to love the piece, and there are numerous recordings of it by just about everyone. Still, this one's got Argerich, and that counts for something. Saint-Saens subtitled the work "A Zoological fantasy for 2 pianos & ensemble," and the soloists are splendid. Each of the fourteen little segments comes off beautifully, with plenty of life and sparkle. While they all shine, the "Aquarium" is particularly atmospheric, the "Fossils" are fun, and, of course, the famous "Swan" (cello solo by Gabriele Geminiani) is as lovely as ever. The thing about this album is, though, no matter how many new recordings we keep getting of the Organ Symphony, so far none of them have challenged my own personal favorites: Louis Fremaux with the City of Birmingham Symphony Orchestra (Warner Classics or Klavier), Charles Munch with the Boston Symphony (RCA or JVC), and Jean Martinon with the Orchestre National de l'ORTF (Brilliant Classics). And, I might add, the folks at Warner Classics already offer the same coupling as here--Third Symphony and Carnival of the Animals--with Fremaux at a bargain price. With the Fremaux disc having wonderful performances and excellent sound, it makes it hard for any newcomer to compete; indeed, if this new entry didn't involve Martha Argerich, it probably wouldn't be a contender at all. Producers Giacomo De Caterini and Michael Seberich recorded the music live in April and November 2016 in the Sala Santa Cecilia (Organ Symphony) and Sala Petrassi, Auditorium Parco della Musica, Rome. 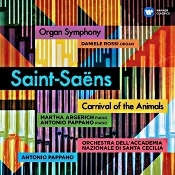 Warner Classics mark the issue as "Santa Cecilia Live," so one must assume they recorded both works live; however, for reasons unknown, a loud outburst of applause accompanies the close of the Organ Symphony, while the Carnival of the Animals ends in dead silence. Maybe they didn't do the Carnival live? I don't know. But I preferred the silence. Anyway, the sound in the Organ Symphony is a little close, as we might expect from a live recording, providing a reasonably quiet response, with a huge dynamic range and good impact. It also produces a touch of brightness, edge, and glare, however, and a small degree of fuzz. There seems little depth to the orchestra as well, which is unfortunate, so things are rather one-dimensional. Timpani are prominent in the symphony, which is good, but as I mentioned earlier the organ is not especially deep, just loud. In the Carnival, which the composer scored for around a dozen instruments, the sound is better--cleaner, warmer, smoother, more transparent, and, while still fairly close-up, not so obviously flat. From standard repertoire to rare gems, no one interprets George Frideric Handel like conductor Nicholas McGegan and Philharmonia Baroque Orchestra and Chorale, who will perform back-to-back Handel programs in December. First will be PBO's critically-acclaimed, historically-informed performances of Handel's Messiah in concerts December 8-10 followed by the rarely performed Joseph and his Brethren with concerts December 14-17. McGegan and Philharmonia Baroque Orchestra and Chorale will inspire audiences with Handel's holiday treasure Messiah at Herbst Theatre, San Francisco, CA on Friday, December 8 at 7 pm; on Saturday, December 9 at 7 pm at First Congregational Church in Berkeley, CA; and Sunday, December 10 at 3 pm at Weill Hall, Green Music Center in Rohnert Park, CA. The Orchestra and Chorale will be joined by soprano Yulia Van Doren, mezzo-soprano Diana Moore, tenor James Reese and baritone Philip Cutlip. There will be a pre-concert talk given by Philharmonia Chorale Director Bruce Lamott forty-five minutes prior to each performance that will be open to all ticket-holders. 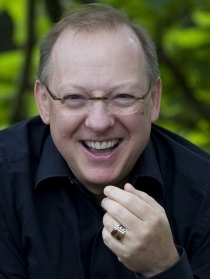 McGegan is also excited to present Handel's Joseph and his Brethren, never performed before by PBO. The program features mezzo-soprano Diana Moore in a trouser role as the title character with soprano Sherezade Panthaki, tenor Nicholas Phan and baritone Philip Cutlip. Soprano Gabrielle Haigh and mezzo-soprano Abigail Levis will also be featured, as will the Philharmonia Chorale who will perform the roles of Joseph's Brethren, Egyptians and Hebrews. McGegan leads PBO in Joseph and his Brethren on Thursday, December 14 at 7 pm at Herbst Theatre in San Francisco; on Friday, December 15 at 7:30 pm at First United Methodist Church in Palo Alto, CA; and on Saturday, December 16 at 7 pm and Sunday, December 17 at 4 pm at First Congregational Church in Berkeley, CA. There will be a pre-concert talk given by Philharmonia Chorale Director Bruce Lamott forty-five minutes prior to each performance that will be open to all ticket-holders. Tickets range from $28 to $125. For more information about these and other Philharmonia Baroque Orchestra & Chorale concerts, visit philharmonia.org. For tickets, visit cityboxoffice.com or call 415-392-4400. Tickets to the Green Music Center available at gmc.sonoma.edu. (Save 20% on tickets now and catch all the drama and intrigue as this story unfolds December 14-17 in Palo Alto, San Francisco and Berkeley. Special e-mail offer: 20% off tickets! The region of Northern Africa to the west of Egypt, once known as the Barbary Coast and later, the Maghreb, nurtured a volatile mix of Phoenician, Carthaginian, and later Berber, Jewish, and Arabic cultures. Its most legendary city a sacrifice to Rome's founding, its more recent turmoil the troubled heir of European colonialization. An ethnic cauldron and brutal colonialism forged a vibrant and kaleidoscopic musical tradition that lives on to this day. Please join us for our second collaboration with Afro Roots Tuesdays, as we welcome an ensemble of gifted musicians of Algerian, Tunisian, and Morrocan origin, for an early music concert surely unlike any other. The capital of Tunisia was once the legendary city of Carthage. Its Queen Dido, loved and abandoned by Aeneas on his mission to found Rome, inspired countless musical masterworks from the baroque era to Berlioz. This concert alternates cantatas dedicated to the Carthaginian Queen with the Arabic form of improvisation known as Taksim, as two historically informed ensembles – one western and the other Tunisian, share a stage, offering a new perspective on Dido the misused monarch and the site of Northern Africa as both exploited resource and object of fantasy in the Western European mythscape. "A Pure Classical Thrill Ride"
The value of a classical concert is not a function of length. Take the Cleveland Orchestra this last week. Friday night at Severance Hall, the group delivered a near-perfect 18th-century package, all in a little over an hour. It didn't used to be this way. In an amusing pre-concert address from the stage, two orchestra members and conductor Nicholas McGegan, a specialist in early music, reminded the first 'Fridays@7' audience of the year that concerts in Mozart's day were often elaborate, evening-length affairs featuring any number of performances. Happily, on Friday, the orchestra cut right to the chase. Between Mozart's Piano Concerto No. 9 and 'Linz' Symphony No. 36, the group had just enough to delight and engage but not enough to overstay any welcome." After such joys, one truly couldn't have asked for more." San Francisco Girls Chorus (SFGC) presents its annual holiday concert, "Greetings From All Seasons!" on Monday, December 18, 7:30 p.m. at Davies Symphony Hall. This year's concert will celebrate holiday traditions of multiple faiths with a selection of festive music from across the world. Music Director and Principal Conductor Valérie Sainte-Agathe will lead the combined forces of nearly 300 choristers and various featured guest artists including soprano and SFGC alumnae Michele Kennedy (1995); multi-instrumentalist and traditional music specialist Shira Kammen; Stanford University Organist Robert Huw Morgan; and Ensemble Alcatraz percussionist Peter Maund. Continuing its commitment to new music, SFGC will also present two World Premieres including Parable by Richard Danielpour, a commission inspired by the Iranian New Year Festival of Nowruz, and "I Wrote Your Name" from "Syrian Seasons" by Seattle-based composer Eric Banks. Tickets range in price from $30 to $60, and can be purchased by calling (415) 392-4400 or through City Box Office online at cityboxoffice.com. On Saturday, December 2, 2017 at 11:00am, Fulton Area Business Alliance (FAB) and contemporary opera producer American Opera Projects (AOP) will offer The Brooklyn Cultural District Walking Tour, a free, two-hour guided walking tour through Fort Greene, Brooklyn that shows how the neighborhood has become one of the most vibrant hubs for the arts in America today. Live performances by opera singers of specially selected songs accompany the tour. The tours are free, but space is limited and advance registration is required. For registration and more information about the tours, visit http://bit.ly/FABTour or contact: tours@faballiance.org or 718-398-4024. First Chance Informance of Act II. Run time: 60 minutes. Philadelphia Dance Projects in partnership with American Opera Projects will present an "Informance" with choreographer Christopher Williams and composer Gregory Spears as the culmination of a creative artist residency to further develop their original dance opera, Wolf-in-Skins. An "Informance" is a work-in-progress showing, where the artists are in conversation with the audience about the content of the work, their ideas and inspiration. Dancers, singers and musicians will perform sections from the work. Join the movement & give back, November 28th, 2017. We have two days for getting deals - Black Friday and Cyber Monday. On #GivingTuesday, we have a day for giving back! Together, people are creating a new ritual for our annual calendar. #GivingTuesday is the opening day of the giving season: a reminder of the "reason for the season." Every act of generosity counts, and each means even more when we give together. Bringing the newest and the best contemporary music to the people of San Antonio, therefore establishing our city as one of the most eclectic cultural centers in the United States, and educating the future generation of music lovers and professionals, who will continue to spread the joy, fulfillment, and the compassion that music promotes. As you prepare for Thanksgiving, Experiential Orchestra is busily preparing for our first-ever Nutcracker Dance Party next week! In true EXO fashion, we have assembled an outrageously brilliant orchestra to perform the complete ballet in its full orchestration, so you will hear all of Tchaikovsk's gorgeous orchestral colors in all of their glory and mystery and magic. If you don't have tickets yet, now is the time! A perfect early Christmas gift, or a great way to start this holiday season with pure joy. No ballet experience is necessary for this dance party, and if you would rather not dance, there are seats available either inside the orchestra, where the sound will surround you and embrace you, or off to the sides (if you'd prefer to be like Marie in the second act). $40 for dancing or standing room; $75 for a seat inside the orchestra; $100 VIP ticket with champagne reception. Adult tickets: $40 for dancing-room or seats farther away, and $75 for prime seating. 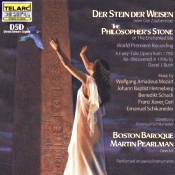 Kurt Streit, Alan Ewing, Chris Pedro Trakas, Paul Austin Kelly, Judith Lovat, Jane Giering-De Haan, Sharon Baker; Martin Pearlman, Boston Baroque Orchestra. Telarc CD-80508 (3-disc set). The longer we live, the less we know. You'd think that after two hundred years, about everything that we could possibly learn about Wolfgang Amadeus Mozart would have surfaced. But not so. The "et al" in the heading means that only recently did Professor David Buch discover conclusive evidence that near the end of his life Mozart collaborated with four other composers to produce The Philosopher's Stone, a singspiel or comic opera with dialogue. In 1996, Dr. Buch found a previously unknown copy of the work with the names of its contributors clearly marked on the top of each page. For a long time music scholars had thought that Mozart might have had something to do with the opera, but when Mozart's name appeared above three of the numbers, the professor had his proof. The four other composers are Johann Baptist Henneberg, Benedikt Schack, Franz Xavier Gerl, and Emanuel Schikaneder. The year was 1790, a year before Mozart would publish his Magic Flute. The question is, why would Mozart have contributed his talents to a production with other composers and take so little or no credit for himself? There are several possible answers. The foremost is that he needed the money. More important, though, he probably just enjoyed working with the others. The same team that produced The Philosopher's Stone would shortly thereafter produce Mozart's own Magic Flute, so these men were clearly friends and business associates. In any event, it is important to find Mozart's name attached to anything not previously attributed to him, and Telarc do a splendid job giving us a world premiere recording of the work. The Philosopher's Stone, subtitled The Enchanted Isle, was apparently a popular piece of entertainment for its time, remaining in the repertory of the Theater auf der Wieden for about twenty-four years and receiving many more performances throughout Germany and Europe during that time. The work sounds unceasingly cheerful, based on much the same fairy-tale material as The Magic Flute. It's all about sylvan landscapes, shepherds and shepherdesses, love and lovers, demons and evil spirits, jealousy, dwarfs, and a trial by bird song. It's a plot that one must revisit frequently for any comprehension, but the arias, duets, ensembles, and musical interludes are fun, if frivolous, while they last. Telarc's producer James Mallinson does things up right by employing Martin Pearlman and his period instruments band Boston Baroque and a worthy cast of singers to head up the entertainment. The playing and singing are splendid. Then to top things off, engineer Jack Renner ensures that the sound is ultra smooth. However, I also found the sound a bit dry and sterile. There is not a lot of sheen at the top end; and, disconcertingly, as people walk about the stage their voices change in dimensionality but we never hear their footsteps. In the old Culshaw days at Decca, the listener was aware of almost all stage movements, lending the proceedings a greater air of realism. Oh, well. Mercifully, the Telarc recording remains free of its patented big bass drum, and for the most part the sound is clean and clear. The Telarc engineers accommodate the opera itself on two CDs, with a third, bonus disc devoted to a short discussion by the conductor on the importance of Mozart's contributions to the work. Overall, it's a release worthy of investigation by anyone interested in classical music, Mozart, light opera, or musicology. Steven Richman, Harmonie Ensemble/New York. Bridge 9493. The last time I wrote about Steven Richman and the Harmonie Ensemble/New York, it was an album of Gershwin music that became one of my favorite recordings of 2016. This time out, Maestro Richman chose to celebrate the 150th anniversary of a fellow conductor, the legendary Arturo Toscanini (1867-1957). I say "legendary" because in my mind Toscanini really was a legend. Growing up in the 1940's and 50's as I did, to me Toscanini was one of those gods of the classical world with strange and exotic names like Stokowski, Rubinstein, Rachmaninoff, and Stravinsky. But Toscanini was, again for me, the master of them all, and later when I got into collecting classical recordings, I always regretted that Toscanini had not lived much into the stereo era. So, here we have Steven Richman taking up some of the slack by providing us with a little of the old Maestro's favorite lighter fare, many in Toscanini's own arrangements and with Richman using one of Toscanini's own batons to direct the proceedings. Audiences loved what Sir Thomas Beecham used to call "lollipops," fun pieces with which he often closed shows, and Leopold Stokowski might be best known today for his work in the Disney film Fantasia. But we don't often think of the great Toscanini as having a lighter side at all. He did. And here is some of that. The disc includes Verdi's Aida Overture, Bizet's Carmen Suite (arranged by Toscanini), Tchaikovsky's Nutcracker Suite, Waldteufel's Skaters Waltz (again arranged by Toscanini), and Rossini's William Tell Overture. Richman begins things, then, with the Aida Overture, which one doesn't often hear by itself, understandably because the composer never actually published it. Verdi wrote it for the opera's premiere but set it aside in favor of the more-familiar prelude. 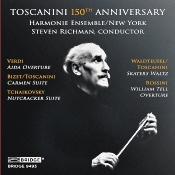 Toscanini performed it only once, in 1940, and essentially from memory. So, the opening number is a rarity, and Richman appears to do it full justice, with zest and enthusiasm. The Carmen Suite that follows is one Toscanini put together himself when in his seventies. The differences between Toscanini's suite and others are so slight I couldn't detect them, but I could easily see how Richman tries to emulate Toscanini's celebrated no-nonsense approach to the score. Tempos and modulations are on the quick, succinct side, with no hint of dallying or sentimentality. Likewise, Richman handles the Nutcracker Suite in a completely unfussy manner. For some listeners, Toscanini's style was too cold and calculating; to others, it perfectly reflected a composer's intentions. Richman attempts to convey that same spirit of contention. You either love the conductor's methods or you don't. I found it all quite persuasive. Emile Waldteufel meant his Skaters Waltz for a smallish chamber orchestra, and that's how we usually hear it. But Toscanini wanted to do it up for a bigger group, so he reorchestrated the piece in the 1940's for his NBC Symphony Orchestra. As expected, it's a full, lush, vigorous rendition, although in Richman's case I don't know that the size of the ensemble seems to matter. The program ends with Rossini's William Tell Overture, which Toscanini conducted for the first time when he was nineteen and for the last time when he was eighty-five. Richman captures the work's excitement as Toscanini doubtless did but imposing on it few idiosyncrasies of his own. He uses the composer's manuscript but also follows Toscanini's practice of doubling the five solo cellos at the beginning for a fuller, mellower sound. Most classical fans will probably already have in their collections multiple versions of these chestnuts (with the exception, perhaps, of the Aida Overture), so why would they want yet more? In this case, the performances are so direct and so straightforward that the music actually appears fresh and new. And the sound is so good and so natural, it puts most other recordings to shame. Producer Steven Richman and producer and engineer Adam Abeshouse recorded the album at the Performing Arts Center, Purchase College, State University of New York in March 2015. There's a fine sense of place and space about the recording, imaging depth and spread providing a realistic ambience without sounding exaggerated. Detailing is good, too, without being bright or edgy. The dynamics help as well, with huge increases and decreases in volume as the occasions arise. A commendable disc all the way around. On Monday, December 4, 2017 at 8:00 p.m., the American Classical Orchestra, "the nation's premier orchestra dedicated to period instrument performance (Vulture)," presents a holiday program featuring the acclaimed ACO Chorus in the Christmas portion of Handel's Messiah, performed in the sacred setting of St. Ignatius of Antioch Church, NYC. Soloists will include sopranos Katherine Wessinger and Nola Richardson; altos Kate Maroney and Clifton Massey; tenors Andrew Fuchs, Nils Neubert, and Gene Stenger; and basses Timothy McDevitt and Edmund Milly. For the first time ever, ACO also performs Carl Philip Emmanuel Bach's Magnificat. This season, the American Classical Orchestra is launching an innovative Concert Preview program that will bring listeners closer to the music. Before conducting the program, Maestro Crawford will deliver an introduction, with the full orchestra and chorus onstage to perform excerpts from the evening's program. Crawford's engaging narratives, along with the live music, will give the audience greater insights into what they're about to hear, resulting in a more enriched musical experience. Additional concerts in the ACO's 2017-18 season include five Baroque concertos with violinist Stephanie Chase at Alice Tully Hall on February 8; and a program of works by Brahms, Schubert, and Ries with contralto Avery Amereau and the ACO Men's Chorus on March 24. Monday, December 4, 2017 at 8:00 p.m.
Tickets for the December 4 concert can be purchased at http://aconyc.org/concert-event/cpe-bach-handel/ or by calling ACO at 212.362.2727. Please visit www.aconyc.org for more information. The Salisbury Symphony and the Salisbury Symphony Chorale present their first holiday concert of Christmas excerpts from Handel's ever-popular Messiah. The concert will take place on Tuesday December 19 at 6.30pm at First Presbyterian Church, 308 W Fisher Street, Salisbury, NC. This concert is part of the inaugural season for the newly-formed 40 member-strong Salisbury Symphony Chorale, which has already earned a reputation as a leading choral society in the region following their highly acclaimed concert with St. John's Lutheran Church as part of the celebration of the Reformation's 500th anniversary. Soloists for the Messiah are University of North Carolina School of the Arts-trained soprano Anyée Farrar, alto Alden Pridgen, tenor Logan Weber, and bass Eric Powell. 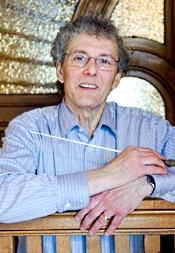 Music Director David Hagy will conduct this concert, which also features an 18-piece orchestra. Tickets are $15 for adults and $5 for ages 18 and below. Children under 10 years old get free admission. Seating is general admission. Tickets can be purchased by phone at 704 216 1513 or online at www.salisburysymphony.org. Pentatone announce that Magdalena Kožená, one of the most celebrated vocalists of our time, has formed a long-term partnership with the label. This new partnership will showcase the breadth of her repertoire over several albums, from Baroque opera to contemporary art song, from Rameau to Berio. The Czech mezzo-soprano spent time in the recording studio this past summer and documented a selection of heart-wrenchingly beautiful songs from her homeland by Dvorák and Janácek, coupled with some of the repertoire's most famous melodies, including Strauss's eternal "Morgen!," Chausson's poetic "Chanson perpétuelle" and Brahms's "Two Songs," Op. 91 – some of them in new arrangements. Joining her were her husband, Sir Simon Rattle, in his first-ever appearance as a pianist on record, and six of their closest colleagues: Wolfram Brandl and Rahel Rilling on violin, Yulia Deyneka on viola, Dávid Adorján on cello, Andrew Marriner on clarinet and Kaspar Zehnder on flute. Giancarlo Guerrero, who has led the Nashville Symphony as its Music Director for nearly a decade, has in the last six months picked up two additional posts in Europe. Today, the Gulbenkian Orchestra in Lisbon announced that it has appointed Guerrero Principal Guest Conductor. He will conduct up to four weeks with that orchestra, beginning in August 2018. Just six months ago, in June 2017, it was announced that Guerrero will be the new Music Director of the NFM Wroclaw Philharmonic in Poland, where he will conduct four weeks in 2017/18 - increasing to eight weeks in the 2018/19 season - and take part in touring and recording projects. Guerrero was appointed Music Director of the Nashville Symphony in 2009 and has committed to serve in this role through the 2024/25 season. 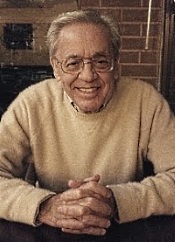 During his tenure, Guerrero and the orchestra have made more than a dozen award-winning recordings for Naxos, and have won eight of the ensemble's eleven Grammy Awards. For more information, visit www.giancarlo-guerrero.com. The Young People's Chorus of New York City (YPC) celebrates the holidays at Carnegie Hall with its Winter Wonder program featuring soprano and Metropolitan Opera star Ailyn Pérez as guest artist on Thursday, December 14 at 7:00 p.m. Under the direction of YPC Artistic Director/Founder Francisco J. Núñez and Associate Artistic Director Elizabeth Núñez, the program highlights the different ways New York City families commemorate the festivities, with repertoire including holiday classics and international songs sung by over 400 YPC choristers ages 8 to 18. Tickets priced $25-100 are available via the Carnegie Hall Box Office, 154 West 57th Street; by calling CarnegieCharge at 212-247-7800; or by visiting the Carnegie Hall website, carnegiehall.org. Washington, DC's intrepid PostClassical Ensemble (PCE) and Music Director Angel Gil-Ordoñez perform "Music in Wartime: A Pearl Harbor Day Commemoration" at the Washington National Cathedral on Thursday, December 7, 2017 at 7:30pm. Produced by PCE's Executive Director Joseph Horowitz, the performance is comprised of musical responses to war from Hanns Eisler, Dmitri Shostakovich, and Arnold Schoenberg. The concert marks the start of PCE's inaugural season as the Cathedral's ensemble in residence and underscores PCE's drive to use this season to contextualize music throughout history. The concert begins with Eisler's The Hollywood Songbook, a collaboration with playwright and poet Bertolt Brecht, a wartime workers' song performed as a processional. The set of 46 short songs details the affliction of war and the helplessness these German emigres felt as they watched from California as their homeland slipped into dissolution and destruction. Shostakovich's Piano Trio No. 2 is a cry of pain provoked by the barbaric Nazi Siege of Leningrad, in which half a million perished. Concluding the performance, Schoenberg's seething and exalted Ode to Napoleon, composed in Los Angeles in response to Pearl Harbor, uses Lord Byron's "Ode to Napoleon" to excoriate Hitler and exalt Franklin Delano Roosevelt. Byron's poem rages against the autocrat Napoleon in favor of the democrat George Washington; Schoenberg uses this inspiration to draw comparisons between Hitler and FDR. SF Symphony's fire relief benefit: Sunday, November 19, Davies Symphony Hall, Civic Center, San Francisco, CA. In the wake of the devastating wildfires that brought extensive damage throughout the North Bay last month, many artistic organizations have looked for ways to contribute to the relief efforts. The healing power of music--not to mention the opportunity to garner financial support for those affected--makes a benefit concert the natural path. The renowned Emerson String Quartet has returned from a European tour to perform at the Alice Tully Hall, NYC on November 28, 2017 at 7:30 PM. The program features Beethoven's B-flat-major quartet, which shattered tradition with six movements, including the profoundly beautiful "Cavatina"; the original ending, the Grosse Fuge, was deemed too momentous for an already overpowering work and now stands alone in the repertoire. The "indispensable" Emerson String Quartet (Newsday) will perform both pieces along with Shostakovich's Thirteenth Quartet, a surreal piece in which simplicity becomes sonically extraordinary. The Chelsea Symphony, featured in the hit Amazon show "Mozart in the Jungle," announces the continuation of its 2017/18 season, entitled "Sea Change," with a holiday concert on December 1 featuring special guest, comedian Judy Gold, narrating "The Night Before Christmas" by composer Aaron Dai. 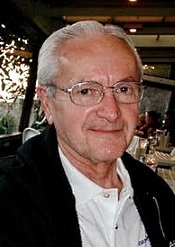 The concert also includes Bedrich Smetana's The Moldau, Carl Reinecke's Flute Concerto, featuring flutist Dirk Wels, Maurice Ravel's Tzigane, featuring violinist Megan Hilands, Leopold Mozart's Sinfonia pastorale, "Alphorn" and Wolfgang Amadeus Mozart's Concert Rondo featuring trumpetist Warren Wernick, and seminal holiday classic, Leroy Anderson's "Sleigh Ride" with guest conductor Pam Aubin. A silent auction in support of the orchestra will take place before the downbeat and during intermission, concluding during a festive complimentary wine reception following the concert. Start your holiday season with The Chelsea Symphony! 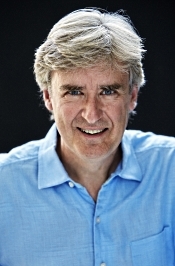 Thomas Dausgaard, Danish National Radio Symphony Orchestra. Dacapo 8.224097. And, Hartmann-Bournonville: The Valkyrie. 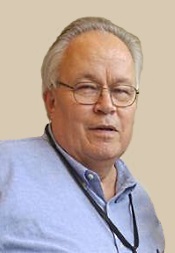 Michail Jorowski, Radio-Sinfonie-Orchester Frankfurt. CPO 999 620-2 (2-disc set). Danish composer Johan Peder Emilius Hartmann (1805-1900) lived nearly the whole of the nineteenth century. Think of that: Haydn was still alive when Hartmann was born, and Mahler was just finishing his Fourth Symphony when Hartmann died. 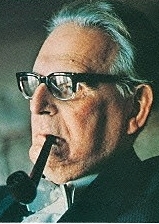 Although not so popular anymore, during most of this time Hartmann was at the center of Danish musical life as an organist, composer, and co-director the Copenhagen Conservatory. His works include operas; ballets; vocal, orchestral, organ, and piano pieces; popular songs; and chamber music. The five overtures featured on this 1999 release from Maestro Thomas Dausgaard and the Danish National Radio Symphony Orchestra reveal a distinctly Romantic leaning, as we might expect, yet a modern, adventurous spirit as well. There is nothing particularly remarkable about any of the overtures, but they are clearly a step toward tone painting and even impressionism, and the conductor and orchestra give them full measure. The five overtures are Yrsa, Axel og Valborg, Hakon Jarl, Correggio, and Guldhornene. He based most of them on Danish folk lore, poetry, and legend. Of the five, two stand out for me: First, there is Guldhormene, or The Golden Horns, because it is background music for the recitation of a poem by Adam Oehlenschlager, one of Denmark's "Golden Age" dramatists. It is not the longest work on the disc, but it covers the most sweeping ground. To be honest, though, I could have done without the recitation by Bodil Udsen and just enjoyed the music by itself. The second standout is Hakon Jarl, a descriptive work that tackles no less than "the struggle of Heathendom in Norway against Christianity, and the victory of the latter under Olaf Trygvason." 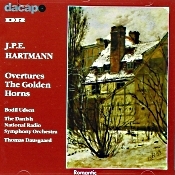 Like the other overtures, it begins with a slow, moody introduction soon developing into a series of contrasting sections that become quite exciting and contain some of Hartmann's most imaginative tunes. For those listeners seeking a more sustained and substantial output from Hartmann, the CPO label simultaneously issued a two-disc set of his ballet The Valkyrie, with Michail Jorowski and the Radio-Sinfonie-Orchester Frankfurt. In four acts and based on a story by August Bournonville, the work is somewhat bombastic but highly descriptive. As the title suggests, it is all about gods and warriors and Valkyrie of ancient Norse mythology. Music scholars consider it one of the great ballets of Danish theater. Although it did not particularly impress me on my one and only listening, ballet fans should find much to enjoy in its 103 minutes. 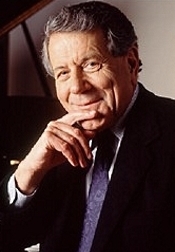 Whether Maestro Jorowski helped or hindered my appreciation of the music, I could not say. Both Dacapo's and CPO's sound is remarkable in its unremarkableness. This is not meant as a criticism, just an observation. The sonics appear moderately distanced and slightly veiled, with passably good depth of field, little deep bass, and rather mundane dynamic impact. Like Hartmann's music, nothing really stands out, but that is the way it probably should be. 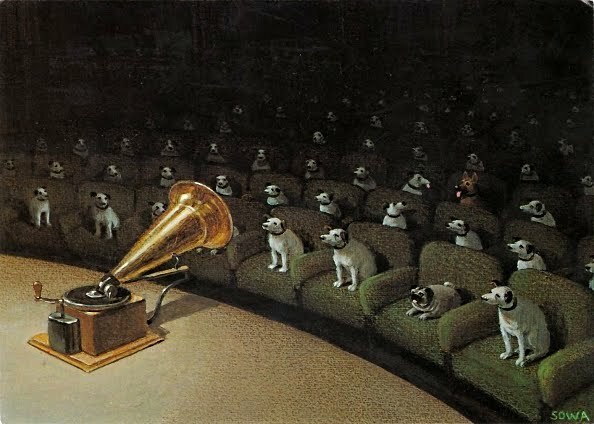 Unless the listener is an audiophile more interested in how the discs sound than in the music itself, the albums should satisfy because nothing calls attention to itself. These are unassuming releases of unassuming music. Valer Sabadus, countertenor; Nuria Rial, soprano; Christina Pluhar, L'Arpeggiata. Erato 0190295811693. This is another novelty from conductor (and therobist) Christina Pluhar and her Baroque ensemble L'Arpeggiata: A recording that blends a period band with a contemporary jazz quintet to do improvisations inspired by the works of German composer George Frederic Handel (1685-1759). Ms. Pluhar and her group have done this kind of thing several times before, notably with albums of music by Purcell, Monteverdi, and Cavalli. The results may remind you, as they did me, of the discs from the Jacques Loussier Trio, a jazz group that has successfully navigated the classical world for decades. But Ms. Pluhar and her players go them one better in combining historical instruments with modern jazz ones and coming up with lusher, richer tones that still maintain much of the spirit of the original composer. The program, mainly arias, highlights soloists in some selections, the jazz players on some tracks, and the period instruments ensemble in yet other numbers. What's more, some of the pieces are well known while others are less famous; some are slow, while others are fast; some are recognizable as Handel, while others are not quite so identifiable; and some are done relatively straight, while others are more jazz inflected. Thus, we get a good variety of music, from the energetic pomp of "The Arrival of the Queen of Sheba" (with interjections by the jazz ensemble) to the familiar larghetto "Ombra mai fu." Whether any of this will appeal to the committed classical lover or the enthusiastic jazz fan, however, is another story and entirely a matter of taste. So, OK, admittedly, it's a little hard to judge either the music or the performances until you get past the oddity of the album's concept. Nevertheless, even though one may question the album's purpose and appeal, there should be no question about its sincerity. Ms. Pluhar and her fellow musicians appear wholly committed to the approach, whatever classification you might apply to it. She and her players are excellent, professional musicians who produce crisp, well-polished performances, whether you call it classical, jazz, or fusion. The opening tune is a good example of the program's diversity as well as its controversy. Even the seasoned Handel admirer might have trouble recognizing the Sinfonia from Alcina, beginning as it does with light jazz riffs that take a while to open up into something resembling traditional Handel. The next piece, the aria "Venti, turbini" from Rinaldo, is more clearly Handel, especially when the countertenor Valer Sabadus enters, and no amount of jazz accents can hide the composer's rhythms. And so it goes. The aria "O Sleep, why dost thou leave me" from Semele has the lovely quality of a music-box lullaby about it; the Vivaldi Allegro from Concerto in G minor finds a more jazz-oriented tone with double bass, piano, and clarinet dominating the piece until the rest of the players join in; and so on. Earlier I asked whether the album would appeal more to jazz or classical lovers, and I'm hard pressed to provide an answer. There may not be enough of one or the other idiom to satisfy either camp. So maybe its appeal is to neither; that is, its major attraction may be to folks who don't have strong convictions one way or the other. Then again, those same listeners may think it's too much of one or the other, jazz or classical, so who knows. The album is an odd duck, to be sure. My recommendation is to try and listen to as many selections from it as possible before laying out any cash. I found a lot of it delightful and fascinating, but at seventy-five minutes, it also seemed a bit too much of a good thing. Sound, mixing, and mastering engineer Hugues Deschaux recorded the album in Switzerland in November 2016. The sonics have a smooth, well-rounded texture that is pleasing to the ear if not entirely transparent. The room acoustics open up the sound to a warm bloom, with a good sense of space and depth. Much of it, though, appears a bit too close up in relation to the softness of the music, which would seem to indicate a more distant perspective. Still, minor quibbles. The sound is appealing. Known for pioneering rare and captivating site-specific performances, On Site Opera (OSO) will produce the New York premiere (and the first production since its world premiere) of Ricky Ian Gordon's Morning Star on March 21-22, and 25, 2018, at the Eldridge Street Synagogue, NYC, in partnership with the Museum at Eldridge Street. This follows their acclaimed recent productions of Mozart's Secret Gardener in an NYC community garden, Milhaud's Guilty Mother in a Hell's Kitchen garage, and the world premiere of Musto's Rhoda and the Fossil Hunt at the American Museum of Natural History's Hall of Saurischian Dinosaurs. Based on the Sylvia Regan play by the same name, Morning Star tells the touching story of an immigrant Jewish family struggling to find a better life on the Lower East Side of Manhattan in the early 20th century. The characters' destinies are shaped by actual historical events: the tragically horrific Triangle Shirtwaist Factory fire in 1911 in which over one hundred immigrant garment workers died after having been locked in the upper floors of a New York City sweatshop, as well as the Great Depression, and World War I. Through it all, the family must learn how to adapt to the country's ever-changing landscape. OSO's performances will fall on and around the 107-year anniversary of the Triangle Shirtwaist Factory fire on March 25. On sale January 11, 2018 at www.osopera.org. San Francisco's acclaimed 42nd Street Moon has announced the full cast and creative team for the 2017-2018 season's Holiday production, the Tony Award-winning family favorite The Secret Garden. Based on the beloved novel by Frances Hodgson Burnett, The Secret Garden has a book and lyrics by Pulitzer Prize-winner Marsha Norman ('night, Mother) and music by Grammy Award-winner Lucy Simon. The Original Broadway Production won two Tony Awards in 1991: Best Book of a Musical (Marsha Norman) and Best Performance by a Featured Actress in a Musical (11-year-old Daisy Eagan, making Eagan the youngest female Tony Award-winner to date). 42nd Street Moon's production of The Secret Garden will feature an all-female creative team, in honor and celebration of the musical's authors Marsha Norman and Lucy Simon (and of Frances Hodgson Burnett, who wrote the original novel). 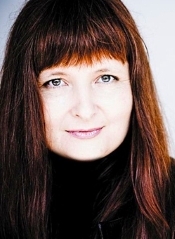 The production will be directed by Dyan McBride (42nd Street Moon's Holiday hit Scrooge in Love! ), with musical direction by Lauren Mayer and choreography by Robyn Tribuzi (making her 42nd Street Moon debut). The Secret Garden runs from December 6 - 24, 2017 and will perform at the Gateway Theatre (formerly the Eureka Theatre), 215 Jackson St, San Francisco, CA 94111. The press opening will take place on Saturday, December 9 at 6:00 p.m. Tickets range from $25 - $76 and can be purchased through the Box Office at (415) 255-8207 or online at www.42ndstmoon.org. British keyboard sensation Benjamin Grosvenor makes his 92Y debut on Wednesday, November 15 at Kaufmann Concert Hall, NYC, at 7:30 pm. Raved by The Los Angeles Times as a pianist who "delivers virtuosity beyond his years" and " If you haven't heard him, hear him now," Benjamin first came to prominence as the outstanding winner of the Keyboard Final of the 2004 BBC Young Musician Competition at the age of eleven, and he was invited to perform with the BBC Symphony Orchestra at the First Night of the 2011 BBC Proms at just nineteen. Since then, he has become an internationally regarded pianist and was announced in 2016 as the inaugural recipient of The Ronnie and Lawrence Ackman Classical Piano Prize with the New York Philharmonic. In his 92Y debut recital, he begins with Bach's French Suite No. 5 in G major, BWV 816 followed by Brahms's Four Pieces, Op. 119, which are interspersed with Brett Dean's 2013 work, inspired by Brahms, Hommage à Brahms. The second half of the program opens with Debussy's Prelude to L'après-midi d'un faune, arranged by Leonard Borwick, and is followed by Berg's Sonata, Op. 1. Ravel's Gaspard de la nuit concludes the performance. The Los Angeles Master Chorale has appointed Elizabeth Greenway to the position of Chief Advancement Officer. Greenway will lead the advancement and development initiatives of the Master Chorale, a resident company of The Music Center and the choir-in-residence at Walt Disney Concert Hall led by Artistic Director Grant Gershon and President & CEO Jean Davidson. Greenway will assume her new position on Tuesday, November 28. Greenway comes to the Los Angeles Master Chorale from Sundance Institute where she is the Director, Institutional Giving and Development Operations, a position she has held since 2015. Her tenure at Sundance began in 2010 as the Associate Director, Foundation and Government Giving before a promotion to Director, Foundation and Government Giving in 2011. She previously held a variety of positions at The Museum of Contemporary Art over a 10-year-period, including Grants Manager from 2005 to 2010. No one interprets George Frideric Handel like Nic McGegan and the Philharmonia Baroque Orchestra. Nic has brought both the classic and rare works of Handel to audiences around the globe for over five decades. As Artistic Director and Conductor at the Göttingen Handel Festival for 20 years, Nic shone new light on nearly twenty Handel operas. 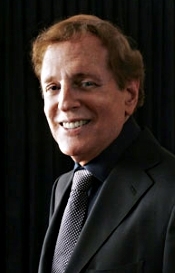 As a recording artist, Nic has explored the depth of the composer's output, with over 50 albums of Handel compositions including a dozen oratorios and close to twenty of his operas. And now, he's adding to that list with Handel's rarely performed oratorio Joseph and his Brethren with PBO in December. Following the performances, PBO will record Joseph and his Brethren marking the first Handel oratorio recording for the Orchestra in 25 years. But unlike the usual live recordings, Nic will take the Orchestra, Chorale, and guest artists into the studio at Skywalker Sound in Marin for a three-day, high-tech recording session. This will be Philharmonia Baroque Productions' eleventh recording for digital and CD release and will be the second-ever recording of this rare and extraordinary work. PBO Chorale Director Bruce Lamott says, "It's hard to find a Handel oratorio that has escaped our attention during the past 37 years, but we are performing Joseph and his Brethren for the very first time, and quite possibly the first time it has been seen in the San Francisco Bay Area. Nic's definitive interpretation will highlight the power of this musical saga in what may be a once-in-a-lifetime listening experience." Don't miss this rare opportunity to hear Handel's Joseph and his Brethren in concerts throughout the San Francisco Bay Area December 14-17. Following a nationwide call for submissions, the Nashville Symphony selected four promising young composers to participate in the second edition of its Composer Lab and Workshop, an initiative designed to cultivate the next generation of great American composers. The four composers – Emily Cooley, James Diaz, Liliya Ugay and Shen Yiwen – arrive in Nashville this weekend to take part in the comprehensive program, led by Symphony music director Giancarlo Guerrero and Pulitzer Prize-winning composer Aaron Jay Kernis, during which they will showcase their music and learn about every facet of working with a major American orchestra. The program will culminate with an open rehearsal at 7 p.m. on Tuesday, November 14, when the GRAMMY-winning Nashville Symphony will perform works by all four Composer Lab participants at Schermerhorn Symphony Center. Admission is free and open to the public. Get Your Tickets and Plan Your Visit WinterMezzo II: February 23 - 25, 2018; San Luis Obispo, CA. Muscians: Alice K. Dade, flute, John Novacek, piano, Jessica Chang, viola, Meredith Clark, harp, Scott Yoo, violin and Jonah Kim, cello. Harry Belafonte. Sony Music 88843025992, remastered. Many years ago, in the 1960's and 70's, I used to listen to a popular weekly FM radio show in the San Francisco Bay Area called "Excursions in Stereo." Similar to John Sunier's even later "Audiophile Edition," "Excursions" gave people a chance to hear some of the best stereo then available. Every week the show's host, Jim Gabbert, would play cuts from his favorite albums, and every week he would invariably include a track or two from the 1959 RCA recording of Harry Belafonte's concert at Carnegie Hall. Naturally, I had to buy the two-LP set for myself, and when I did, I was not disappointed, except that I had taken a while to discover it. It remains one of the best, most realistic reproductions of a live pop concert I've ever heard. When the CD era arrived, RCA cut out a few tracks and fit the program onto a single compact disc. But it wasn't the excising of four or five songs that disappointed me so much as their almost complete destruction of the sound of the live event. Fortunately, that became a forgotten issue, at least for a little while, because in the mid 90's Classic Compact Discs remastered the entire program on two gold discs, restoring much of the original sound (as well as the omitted songs). Gone was the silver disc's harshness and one-dimensionality, replaced by the master tape's richer, cleaner tones and three-dimensionality. Although the sound seemed a little drier than I remembered it from the old LP days, it still conveyed a sense of presence unmatched by most recent digital efforts. This was a treasured LP set that I regretted coming to late in its history, but I was more than happy to have acquired the gold edition. Too bad Classic Compact Discs went out of business years ago, and the gold discs are no longer available (except used, I suppose). Well, that was my history with the recording until the present. Now, I'm happy to say, there's another choice, and it's better than anything that's come before. 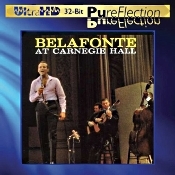 The current incarnation of the Belafonte concert comes to us via UltraHD PureFlection, one of the last projects that FIM (First Impression Music) producer Winston Ma was involved with prior to his death. To manage such a great-sounding disc, Winston had Michael Bishop of Five/Four Productions do the 32-bit remastering and used UltraHD, an extra-precise manufacturing process, to complete the job. One thing noticeable about Belafonte's performances in this concert is that he generally slows things down compared to his equivalent studio releases. You'll observe it in things like "Day-O" and "Jamaica Farewell," which seem more heartfelt taken at the slightly slower pace. 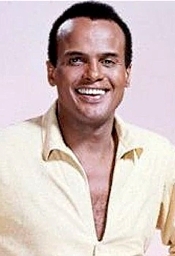 Other than that, Belafonte is Belafonte, the man who practically invented calypso; or, at least, popularized it in America. Wonderful music in 1959; wonderful music today. To evaluate the disc's sound quality, needless to say I put it up against the best version I already had in my collection, the aforementioned gold edition from Classic Compact Discs. Here, the comparison was fascinating. The gold remastering had sounded so much better than RCA's silver disc, I couldn't imagine anything surpassing it. But after adjusting for playback levels, the UltraHD disc did, indeed, eclipse it. Especially in clarity. I had never noticed the gold discs sounding so soft or warm before, but compared to the crystalline clarity of the UltraHD disc, the gold discs appear decidedly veiled, if only slightly. Of course, you may prefer a softer, warmer sound because you think it's easier on the ear. Fair enough; individual preference always takes precedence. But, really, the UltraHD is not only more transparent, it's just as easy on the ear as the gold, with no brightness, harshness, edginess, or glare. What's more, it appears to preserve even more of the original master tape's legendary presence, depth, dimensionality, and general feeling of aliveness than the gold discs. So, overall, the UltraHD is a superb product; no reservations whatsoever. Also, Four Norwegian Dances. Raymond Leppard, English Chamber Orchestra. Pentatone PTC 5186 231. 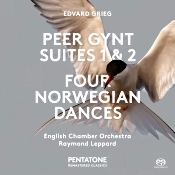 For many years now, some of my favorite recordings of Grieg's music for Peer Gynt have been those of Oivin Fjeldstad with the London Symphony Orchestra (Decca, Classic CD, and other labels), Sir Thomas Beecham with the Royal Philharmonic Orchestra (EMI/Warner or Hi-Q), and the one under consideration here, Raymond Leppard's 1975 album of suites recently remastered on SACD by Pentatone. People today probably know Norwegian composer Edvard Grieg (1843-1907) best for his incidental music to Henrik Ibsen's play Peer Gynt as well as for the Piano Concerto, although my guess is that listeners familiar with Peer Gynt know it from one or the other of the concert suites rather than the complete incidental music. Here, we get both suites, but if you want the complete score, you'll have to go elsewhere, to Per Dreier and the LSO (Unicorn), perhaps, or Neeme Jarvi and the Gothenburg Symphony (DG). Anyway, the suites are enough for most folks, and, as I say, Leppard's handling of them is as good any. Grieg himself extracted the two suites from the complete score, but nobody published the original score until 1908, a year after the composer's death. So maybe that's why we know the suites better than the complete music. In any case, the suites contain all of the most-popular music from the score, four entries in each suite: "Morning Mood," "Aase's Death," "Anitra's Dance," and "In the Hall of the Mountain King"; then "The Abduction," "Arabian Dance," "Peer Gynt's Return," and "Solveig's Song." Leppard's way with this material is always of the most refined quality. He never over dramatizes the music or over glamorizes it. Instead, he lets each movement unfold at a natural pace, using nuanced pauses and contrasts to underline the pictorial characteristics of the score. Leppard always has an eye toward atmosphere rather than pure theatricality; so, yes, there are other more exciting versions of this music you can find, but none as thoughtful. As a coupling, Pentatone offer Grieg's Four Norwegian Dances, also nicely done up by Leppard and his players. Note, though, that the latter Philips disc also includes these items, plus an additional twenty-four minute selection from Grieg's Old Norwegian Romance, Op. 51, recorded by Leppard half dozen years later with the Philharmonia Orchestra. Apparently, Pentatone decided that the material on the original disc was enough, or perhaps the later recording wasn't in surround sound. Philips originally recorded the album in multichannel at the Walthamstow Town Hall, London, in November 1975, but released it only in two-channel stereo. Polyhymnia International B.V. remastered the recording for Pentatone Remastered Classics in December 2015 for hybrid stereo/multichannel playback. As always, if you have an SACD (Super Audio Compact Disc) player, you can play either the two-channel or multichannel formats in SACD and if you have only a regular CD player, you can play the regular two-channel CD layer. I listened in two-channel SACD. The recording provides probably still the best sound you can obtain in this music. The microphone placement gives us just the right amount of space between the instruments to create the illusion of a small orchestra in front of us in a large hall, with just the right amount of width and depth. What's more, the warmth of the acoustic heightens the illusion, without losing too much detail and definition; the bass is taut and deep; and the dynamics are strong. Since I also had on hand the Philips disc of this same recording, I put it into the regular CD player and compared it side-by-side with the SACD 2-channel layer of the newer remaster. After some fiddling with level balances, it was pretty hard to tell the difference. While the SACD was perhaps a tad smoother and fuller overall, it could have been my imagination. However, since the Philips disc may prove hard to come by now that Philips have folded shop, the point may be moot. The Pentatone is a good listen. 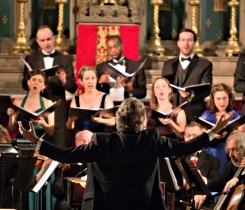 Concerts at Saint Thomas continues its decades long New York City holiday tradition of performing Handel's Messiah at Saint Thomas Church Fifth Avenue at West 53rd Street on December 5 & 7 at 7:30pm. Daniel Hyde conducts the Saint Thomas Choir of Men and Boys in their ongoing partnership with New York Baroque Incorporated, along with soloists Ellie Dehn, Clare McNamara, Lawrence Jones, and Jesse Blumberg. 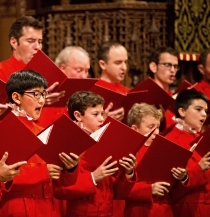 Hailed by The New York Times as "king among the innumerable [Messiah] performances in New York," it is the only Messiah in the city performed with men and boys' choir, and is considered by many to be the start of the Christmas Season. On Thursday, December 14 at 5:30pm, Britten's transcendent and ethereal A Ceremony of Carols provides a meditative respite from the hustle and bustle of the Christmas Season. Daniel Hyde conducts the Boys of the Saint Thomas Choir along with award-winning harpist Bridget Kibbey. The piece, written for harp and boys' choir, unifies the various carols of the Christmas story with a blend of starkness and shivering beauty. The program will also feature works for choir and harp by Ireland and Hadley, as well as pieces for solo harp by Bach, Britten, and Agócs. All concerts take place at Saint Thomas Church Fifth Avenue at West 53rd Street, NYC. Tickets may be purchased at www.SaintThomasChurch.org/music/concerts, by calling the Concerts Office at (212) 664-9360, by email at concerts@SaintThomasChurch.org, or in person at the Concerts Office at One West 53rd Street at Fifth Avenue (enter through the Parish House). The Los Angeles Master Chorale will perform five festive Christmas concerts in Walt Disney Concert Hall in December. The choral programs are a much-loved Los Angeles holiday tradition and these concerts frequently sell out. A blend of favorite Christmas carols, songs, and popular classical compositions, the series of concerts also includes a Messiah Sing-Along concert which allows the audience to sing as the choir. Tickets to all concerts start at $29 and are available now online from lamasterchorale.org, by calling the Box Office at 213-972-7282, or in person from the Dorothy Chandler Pavilion box office, Monday – Saturday, 10 AM to 6 PM. "Festival of Carols with Eric Whitacre"
Orpheus Chamber Orchestra continues its 2017-2018 season on Saturday, December 2, 2017 at 7:00 p.m. in Stern Auditorium / Perelman Stage at Carnegie Hall, NYC, with a performance featuring Norwegian cellist Truls Mørk in Shostakovich's first Cello Concerto and the world premiere of Shuying Li's Out Came the Sun, inspired by the profound and transformative experience of postpartum motherhood. Also on the program is Handel's Water Music, which is featured on two of Orpheus' internationally acclaimed Deutsche Grammophon albums from 1992 and 2003, and Stravinsky's Pulcinella Suite. Single tickets for the December 2 performance, priced from $12.50 to $115, are available for purchase at the Carnegie Hall box office at 57th and 7th, can be charged to major credit cards by calling CarnegieCharge at 212-247-7800, or by visiting the Carnegie Hall website at carnegiehall.org. There are two pivotal moments during the Los Angeles Master Chorale's Voices Within education program when the reality of creating their own songs truly resonates with the fifth grade students taking part: the first is when they realize that they are expected to create the melody for their song — it is not being written for them; and the second is when they are standing alongside professional Master Chorale singers, about to perform the songs they composed. "They straighten up," says Teaching Artist, lyricist Brett Paesel, "and you see them be like, 'Oh! This is really happening!" For students at Huntington Park Elementary School and Mt. Washington Elementary School these performances will happen on Wednesday, November 15 (Huntington Park Elementary, 6055 Corona Avenue, Huntington Park, CA 90255) and Friday, November 17 (Mt. Washington Elementary, 3981 San Rafael Ave, Los Angeles, CA 90065) when they perform their songs for fellow students, teachers, and friends and family. Each school will give two performances. Angela Hewitt, "the outstanding Bach pianist of her generation" (The Sunday Times, London), returns to 92Y's Kauffman Hall, NYC, on Wednesday, November 8 at 7:30 pm to showcase her skills as one of the world's foremost performers and Bach interpreters in the second year of her four-season journey (12 recitals) of Bach's complete keyboard works. "Hewitt played Bach's three-part inventions so that they came over as one single variegated work, with the plangent ninth acting as its dark heart, in the way the Black Pearl variation does for the Goldbergs." The Independent (London) opined. Ms. Hewitt was named 'Artist of the Year' at the 2006 Gramophone Awards, and in 2015 she was promoted to a Companion of the Order of Canada. Fun facts: Ms. Hewitt will meet about 20 students from the High School for Public Service in Brooklyn prior to the concert for a Q&A session in 92Y's Warburg Lounge. This activity is part of the 92Y's Concerts Schools Project that aims to enhance music education for students at NYC public high schools through attendance at live performances in 92Y's world-class Concerts Series and participation in classroom workshops led by professional performing artists. Salon/Sanctuary Concerts program of Italian music opens with an unaccompanied Yemeni chant. The text by Dunash ha-Levi ben Labrat (920-990) is a prayer for peace and freedom, a prayer in praise of the Sabbath, a prayer for security by an uprooted people. Jews from the Middle East were transplanted to Italy as early as Ancient Roman times, as Jews expelled from Spain found a home there after 1492. Italian Jewish communities incorporated descendants of both Sephardic refugees as well as those of slaves brought back from Judaea by conquering Roman armies. That the Jewish presence in Italy was characterized by the familiar and precarious balance between assimilation and exile is well known. What is less commonly explored is the cross-fertilization between Jewish and Christian musical cultures, and the impact this exchange had on mainstream compositional voices of the seicento. On Thursday, November 16, 2017 at 7:30pm, preceded by a 7:00pm Composer/Poet chat, Five Boroughs Music Festival (5BMF) presents the Brooklyn premiere and grand finale performance of the Five Borough Songbook, Volume II with expanded casting at National Sawdust. The project, which premiered in Manhattan and Queens earlier this year in honor of 5BMF's 10th anniversary season, features 20 new commissions inspired by New York City places, people and poetry from twenty composers, and includes solo songs, duets and ensemble works scored for various combinations of voice, piano and cello. The Five Borough Songbook, Volume II received its Staten Island premiere on September 16 at Trinity Lutheran Church and its Bronx premiere on September 17 at the Riverdale-Yonkers Society for Ethical Culture. The Five Borough Songbook, Volume II includes works by Matthew Aucoin, Lembit Beecher, Conrad Cummings, Jonathan Dawe, Evan Fein, Daniel Felsenfeld, Herschel Garfein, Whitney George, Marie Incontrera, Laura Kaminsky, Libby Larsen, Hannah Lash, Missy Mazzoli, Jessie Montgomery, Robert Paterson, Paola Prestini, Kevin Puts, Kamala Sankaram, Gregory Spears and Bora Yoon. Performers for this concert include sopranos Justine Aronson and Marnie Breckenridge; mezzo-sopranos Hai-Ting Chinn and Amanda Crider; tenors William Ferguson and Miles Mykkanen; baritones Christopher Dylan Herbert and Jorell Williams; cellist Sophie Shao; and pianists Thomas Bagwell and Erika Switzer. Have you always wanted to dance with the Sugarplum Fairies, or to glide to the soaring strings in the pas de deux? Now is your chance! EXO is building on its famous Rite of Spring Dance Party, inviting you to immerse yourself in the heart of the orchestra with a Nutcracker Dance Party! Both the adult-only (Thursday, November 30 at 8pm) and the family-friendly (Saturday, December 2 at 2:30pm) version of the concert offer an opportunity to get up close with the orchestra and dance to your heart's desire. The Thursday, November 30th concert offers a ticket package where you can sit INSIDE the orchestra, experiencing the music from within. Seasonal cocktails will be offered to further encourage carefree dancing. Note that no ballet experience is necessary, and if you would rather not dance, there are seats available either inside the orchestra, where the sound will surround you and embrace you in true EXO style, or off to the sides (if you'd prefer to be like Clara, aka Maire, in the second act). Holiday themed-attire and ballet costumes are welcome! Back by overwhelming demand, the Salisbury Symphony and the Piedmont Dance Theatre have announced their collaboration to bring Tchaikovsky's iconic ballet The Nutcracker to Keppel Auditorium (2300 W Innes St, Salisbury, NC 28144) this December. The much-loved holiday ballet continues to break box-office records for Keppel, reaching 100% capacity for three years running. This season's performances will be held on Saturday, December 16th at 6:30pm, with a matinee performance on Sunday, December 17th at 2:30pm. Now in its 15th year, with a new cast from Piedmont Dance Theatre's troupe and in a revised production as conceived by Marius Petipa, The Nutcracker is choreographed by American Ballet Theatre alumna and internationally acclaimed dance star Rebecca Wiley and Juilliard-trained Daniel Wiley, named by Charlotte Magazine as the city's "Best Male Dancer". To celebrate the production's 15th anniversary, The Nutcracker will showcase guest dancers Kathleen Breen Combes performing the role of the 'Sugar Plum Fairy' and Yury Yanowsky as the 'Cavalier.' Ms. Breen Combes, a principal dancer of 15 - years with Boston Ballet, has been hailed by The New York Times as a "ballerina of colossal scale and boldness." Mr. Yanowsky, a 22-year veteran with Boston Ballet, has danced many lead roles with the company and is an award-winning choreographer.